The fun really starts to stack up as you create layer after layer of fun and fabulous PLAY-DOH modeling compound "cake" creations! Use the molds to create layers for your pretend "cakes" and then load up your CAKE MAKIN' STATION tool to add all kinds of amazing decorations on top. Use your "frosting" tool to add "frosting" to the top of each "cake". When you're done with your "bakery" masterpiece, set it on the plate accessory to "serve" to your friends so you can celebrate. Creativity has never looked this yummy before! 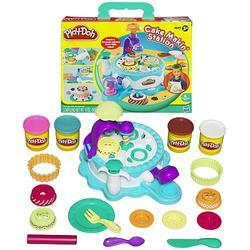 Set includes four three-ounce cans of PLAY-DOH modeling compound, CAKE MAKIN' STATION tool and other fun accessories.